If you already know all about classic betting, it's time to advance to a betting exchange. With a classic bookmaker you can only bet FOR somebody or something. On an exchange you can pick a loser as well. Imagine 15 horses are racing, it's much easier to pick a loser than a winner. Or you think "This soccer match won't end with 2-0 or 3-0". As soon as there is 0-1, you already won! You've picked team A to win. As soon as team A scores, your odds will drop and you can sell your bet with profit! No need to wait for the game to end. You made a bad pick - your favorite has let you down but you can still minimize the loss. You might even get lucky and get out of the situation like nothing happened. Up to 20% higher than with a regular bookmaker. The odds are not being controlled by the bookmaker, you decide and choose the odds. An exchange wants you to win big! Players are responsible for their liability and the ones who lost - pay the other ones who won. An exchange never gives away their own money. They are nothing more than an interface where players from around the globe bet against each other. For this service, they charge commission that has to be paid by the winners. The more you win - the more they earn. You won't get limited once you reach stakes in thousands of €. Your winnings are limited only by the money on the game - meaning - the more traders bet, the more money is available. We've already seen over 20 millions € on a classic tennis game between Nadal and Federer. This money is never lost. It's simply transferred from unlucky betors to the ones who won. In this screenshot, you see a game between Arsenal and Southampton. Matched EUR means there are already bets worth 2.958.416€ placed on this game. The basic options are - Arsenal (to win), Southampton (to win) or The Draw. Take a look at blue and pink fields. Back line means - you bet FOR the team like with a regular bookmaker. Below the odds, there is a certain amount of money (Arsenal - 1,337€) which indicates the maximum amount you can bet on at the moment. You can back Liverpool at 2,28. Meaning, if you place a bet BACK LIVERPOOL they need to win. If Southampton wins or the match ends in a draw - you lost your bet. Same goes for Southampton - available to bet at 5,4 and the draw at 2,64. Those are regular bets, like with every other bookmaker only odds here at the exchange may be higher. Placing a bet is same as everywhere. Click the odds button (for example - Back Arsenal 2.28) and the betting slip pops up on the right. Enter your stake. If you place 50€ on Arsenal, you can lose 50€, or win 64€ (+ your stake back). If you don't wish to go any further with our tutorial, this is enough and you'll be able to place bets at higher odds than before. That would be a shame since a betting exchange offers a lot more! Lay column (pink) means that you are betting AGAINST THE TEAM. Lay means Arsenal won't win the game. Southampton will, or the game will end with a draw. Lay Arsenal odds are 2,30 and should they win, you'll lose at 2,30 and this is the tricky part most of the new players don't understand. If you bet 50€ against Arsenal, you can make 50€. In case you were wrong and Arsenal wins the game, you won't lose only 50€, but you'll lose them at 2,30 - this means 65€! When you are laying (betting against), you can always win as much as you staked. The only difference is how much you can lose! The higher the lay odds - the more you'll have to pay. Laying an event with 100€ at 4,0, can make you lose 300€ or win 100€. Laying an event with 100€ at 1,10 can make you lose only 10€, or win 100€! If you bet against (LAY), you account should have enough funds to cover losses in case you lose. This is called LIABILITY. 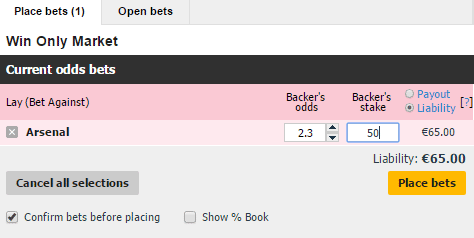 If you bet against Arsenal - simply click the pink button with odds on it. Here are some examples that will help you understand how a betting exchange works. PLAYER 1 (TIM) and PLAYER 2 (JASON) both like to bet and today they sit in a room and will place bets on a match between Chelsea and Manchester. Tim is a fan of Chelsea and is prepared to bet 100€ on them. He searched the Internet and the average odds on Chelsea were about 1.90 (decimal). He doesn't bet against a bookmaker, he bets against a friend and has the power to make up the odds. He wants to bet 100€ at 2.0 on Chelsea to win. Tim puts his 100€ on a desk. If he's right, he'll get 200€. His own stake back + he'll make a 100€. This is called - BACK CHELSEA.But first, he needs somebody, who'll give him those 100€ he wants to make. Jason knows soccer and doesn't fancy Chelsea. He wants to bet against them with 100€ at 2.0, which were offered by Tim. This is called LAY CHELSEA. Both players have now given their stakes to the table - 200€. If Chelsea wins, Tim gets all of it as he has backed them. If Chelsea doesn't win, the 200€ belong to Jason, as he bet against them. If the game ends with a draw or Manchester wins, Jason is our winner. This was a simple example using round odds (2,0). Let's make things a bit complicated in our next example. Tim would like to bet 100€ on Chelsea, but at much higher odds - 3.40. (I don't know where he got this Idea from, but it's his decision!) He puts his 100€ on the table. Jason would like to lay Chelsea with 100€ but doesn't like the odds Tim just made up. "Is Tim going crazy? 3,40? Well... If Jason puts 100€ to the table, Tim could win only 200€ which is not correct, as he wanted to win at 3.40. This means - Jason needs to add 140€ to his stake, all together 240€ to the table to match Tim's request. In case Chelsea wins, Tim gets the money on the table - 100€ his own stake back + Jason's stake 240€ - TOTAL 340€. Should Chelsea lose the game, Jason gets his 240€ back + 100€ from Tim. Now you see why Jason had a huge liability to cover and he would have to be very confident to accept odds like this. Tim is 100% sure that we'll see at least one goal in this game. This is very likely to happen and he can't ask for high odds, but 1.10 should do. He'll bet 100€ on it. Jason thinks this is one of those games that could end without goals. He sees Tim with his 100€ at 1.10 which is acceptable. He decides to bet against him (lay 0-0 or lay 1 goal or more). This time, he only puts 10€ on the desk, as 110€ is the amount Tim would win if the game ends with one or more goals. Should the game end 0-0, Jason gets the money from the table - 110€! He could make a 100€ and only risk 10€ - this is something worth betting on! How did that happen? Like we said - "sure things" have low odds. And to see one goal in a match that takes 90 minutes, is almost certain. And you cannot ask for more than 1,10 to see at least one goal. That was Tim's offer. Jason matched it with betting against him. Now, he can lose at 1,10 and he owes Tim nothing more than only 10€ should, at least, one goal be scored. If the game stays 0-0 for 90 minutes, he has won 110€! (-10€ stake = +100€). ALWAYS REMEMBER THIS - Every bet needs somebody to bet against that decision, otherwise, nobody gets paid. In our virtual world, Tim and Jason aren't really sitting in the same room. They live thousands of miles away and the desk, where they put their money on is actually an exchange betting website! A betting exchange is nothing else than an Internet interface where players can bet against each other. But you won't be alone. Millions of players are using the exchange so the competition will be heavy. Let the trading begin! Tim is a fan of Chelsea and is prepared to bet 100€ on them. He searched the Internet and the average odds on Chelsea were about 1.90 (decimal). He decides he'll bet 100€ at 2.0 on Chelsea to win and puts his 100€ on a desk. If he's right, he'll get 200€. His own stake back + he'll make a 100€. But first, he needs somebody, who'll give him this 100€ which he wants to make. Jason would bet against Chelsea, but has only 10€ to place them at 2.0. He is broke...poor Jason. This is not enough for Tim, as he needs 90€ more for his bet to be completely matched and accepted. And this is called an Unmatched bet. A betting exchange will let Tim know that someone just bet against his decision and 10€ are matched, the rest remains open for other players. Tim has the choice to either lower the odds in order to make the bet more attractive or wait for a while. Maybe someone will come along and take it. Now we have 10€ matched, 90€ remain unmatched. He isn't a Chelsea fan and would like to bet against them. He is rich and would like to risk 1000€. He puts all his money on LAY Chelsea, although only 90€ were available. Tim's interface lets him know, his bet is now 100% matched. Tim and Jason aren't worried about Robert. Their bets are matched. In case Chelsea wins, Tim gets 200€. (100€ his own stake back + 10€ from Jason + 90€ from Robert). If Chelsea doesn't win, Jason gets his 20€ (10€ own stake back + 10€ from Tim). Maybe he had some doubts and thought Chelsea might win after all and cancelled remaining 910€. (yes - unmatched bets can be cancelled anytime!) So, he settles with 90€ matched and if Chelsea fails to win, he gets 180€ (his own 90€ back + 90€ from Tim). In the real world, you won't know from which player the money comes from, but this is exactly how a betting exchange works. Every penny you make is money somebody else lost. Every game has a TOTAL MATCHED amount visible, so you can see how much money is matched at that time. This number can reach millions, so people are making some serious money with it. Someone will lose, someone will certainly win, otherwise, the bet wouldn't be matched and those millions will be split between winners. Hopefully, you'll stay on the winners side of the bet. Tim would like to bet on Chelsea at 2.0. The odds at the moment are at 1.77 (meaning, someone bet against Chelsea at 1.77). Not enough. Tim wants to make more, so he clicks on that 1.77 but enters his own odds 2.0. He's ready to lose 100€. But there is no response. Nobody wants to bet against him at 2.0. Why? A betting exchange will always show only the best odds to the players. If you want to bet on Chelsea (back), the highest odds are 1.77. Tim wanted to bet at 2.0, so his bet would be displayed on the lay side to attract the opposing bettor. But, he is too far away, or let's say - his offer is bad! First, someone needs to bet against them at 1.79, 1.8 and 1.81 before the odds move in his direction. His offer is not even visible, so no one can bet on it. He decides to cancel this bet and place another on Chelsea at 1.78. This is much more realistic as this bet is between the current back and lay option. He clicks on 1.77, enters 1.78 and amount 100€. The bet is visible on the lay side and is immediately matched by players who thank Tim for his low odds. What have we learned from this example? A bad offer or unrealistic odds will not get matched! You're dealing with real-life people with brains on the other side of Internet and everyone would like to get the best deal available. Chelsea can be bet on at 1.77 and Tim will place 100€ on this bet. He doesn't want to enter his own odds, he is happy with 1,77. He sees he can place 999€ on this bet and it will get matched instantly if he is fast (remember he is dealing with thousands of people around the globe. He has only 100€ so he'll click on 1.77, enter 100€ and his bet is matched. By doing this, he matched somebody's bet, who placed 999€ against Chelsea. This can be one or more persons, the total amount was 999€. Now, there is only 899€ available, Tim took the rest. He did that in the morning, hours before the game actually started. Now, minutes before the match starts, there is news on the TV, Manchester has a lot of injured players, some of them are very important for this match! Market changes and the majority now places bets on Chelsea to win and this lowers the odds constantly. Everybody is taking what they can, as Manchester is obviously going to lose without their key players. A player came with a bet worth 10.000€ on Chelsea. He took it at 1.77. But there was only 899€ available. Yes, 899€ are matched, (Tim already took 100€ in the morning), the rest of his money is displayed on the lay side at 1.77. Another hotshot comes along and places 20.000€ at 1.76€ which is currently the highest available odd for Chelsea. It is partially matched, but a large stake wasn't and the rest is now displayed on the lay side with the unmatched amount at 1.76. With doing that, he puts the previous player in a bad position, as he doesn't have much chance to get his 1.77 matched. Why should someone lay at 1.77 if they have 1.76 available? Now you see what moves the odds... Money and the big players - just like on real exchange. What about Tim, who already placed a bet at 1.77 in the morning? WHENEVER BACK ODDS ARE HIGHER THAN LAY ODDS, YOU'LL MAKE MONEY! He already placed 100€ in the morning, which could make him 177€. But now, he gives another 100€ to the table and bets against Chelsea! He heard the news and is happy he made the right decision in the morning. At 1.76, he actually puts only 76€ against them. Hold on... first he bet FOR Chelsea, now against? How come? He is not a risk-taker, he likes to play safe. And he knows - the sport is very tricky and even though Chelsea should win - it may not happen, for whatever reason. He bets against them in order to secure a profit or make a RISK-FREE BET! Backing Chelsea would make him +77€, laying them takes 76€ away from him. 1€ is left and that's his risk-free bet! If Chelsea wins - he makes +1€ and cannot lose anything. BACK ODDS NEEDS TO BE HIGHER THAN LAY ODDS AND YOU'LL MAKE MONEY! Tim placed a bet and can now watch the game knowing, he might win with no risk. We've demonstrated a slight change in odds, which can make you some money. Now let's see when to expect a huge rise or fall. If he placed a bet on Chelsea and left it running, and Chelsea scored first, the odds will drop from immediately from 1.77 to maybe 1.30. All the players are now convinced in their victory and the prices (odds) will always drop. If you put this numbers in the betting exchange calculator, Tim would make 36,15€, no matter how the game ends. Great! If Tim just made 36,15€ simply waiting for the first goal - how did he do that? Try this online calculator (click).You can also download it and have it ready on your computer whenever you need it. Enter the stake - Tim bet 100€. Back odds (in the morning) 1,77 and now, after Chelsea scored a goal - lay at 1,30. 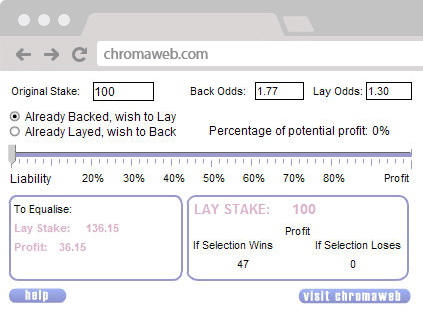 We need to tick the round button "Already Backed - wish to lay" since Tim's first bet was BACK. Now the calculator gives us the data - we need to place 136,15€ on LAY Chelsea in order to make +36,15€ no matter what happens in the game. Tim just made +36,15€ (-5% exchange commission). He could also experiment with the slider and adjust winnings. For instance, if he now placed 100€ on Lay Chelsea now - he would make +47€ in case Chelsea wins. This is a free bet, he took the more secure version - "to Equalise", which gives him nice profit no matter if Chelsea wins or loses. This Calculator should be ready when you're about to trade on a certain game, so get a copy of it! (the link is above this calculator image). Tim placed a matched bet on Chelsea to win - 100€ @ 1.77. In the 10th minute, Manchester scored for 0-1. Panic breaks out on the market. Everyone who placed a bet on Chelsea is now unsure if they can turn the game around. Manchester fans are now pushing the odds for their favorite down while Chelsea odds rise. Tim watches the odds move in the wrong direction and is concerned about his 100€. The odds for Chelsea are now already 3.20, lay Chelsea is at 3.30. He already placed a back bet on Chelsea, so he won't do that again. He puts the current lay odds in the exchange calculator and sees, if he bets 53,63€ against Chelsea, he'll lose only -46,36€. That's much better than to loose a 100€. He might also try the other approach and bet 100€ against Chelsea, so if they lose, he doesn't lose anything. But, should Chelsea win, he'd lose 152,99€! Is he ready to make that risky change? Our advice - NO! Except if you see there is no way for your team to get back in the game. Chelsea could hit the net two times and win. This will make him lose much more than just the initial stake. CAREFUL IF THE LAY ODDS ARE HIGH! If the lay odds are below 2.0 - you always risk less than you can win. And that's the right way to go! With odds above 2.0, you always risk more than you can win! Again take a look at this football game. Chelsea is available at 1.77 and you can bet against Manchester at 5.7. You could bet 197€ against them. Laying Manchester means, the game can end with a draw or Chelsea to win - you'll win. You're covering 66,6% of the possible outcomes. Someone is trying bet on Manchester 197€ at 5.7. Currently, he is still unmatched. And he wants to win 197€ x 5.7. And you - the opposing bettor, are responsible to provide this money. If the back player wins, he'll win a nice amount of cash, but if you lose, you'll be in trouble. Tim - a Chelsea fan would like to bet only 10€, but still, he has to reach deep into his pocket for 47€! Why? It's his responsibility to provide the winning amount to the guy who bet on Manchester! 10€ @ 5.7 = 47€ and this is the money he needs to have on his account and is prepared to lose, should Manchester win the game. Risky! But, if Chelsea scores first, he might be able to trade the bet with profit at once. If Tim wins, he'll get his 47€ back, making only 10€. This is why high lay odds can be a risk to your bank. Visit Betfair and Sign up for a new account. 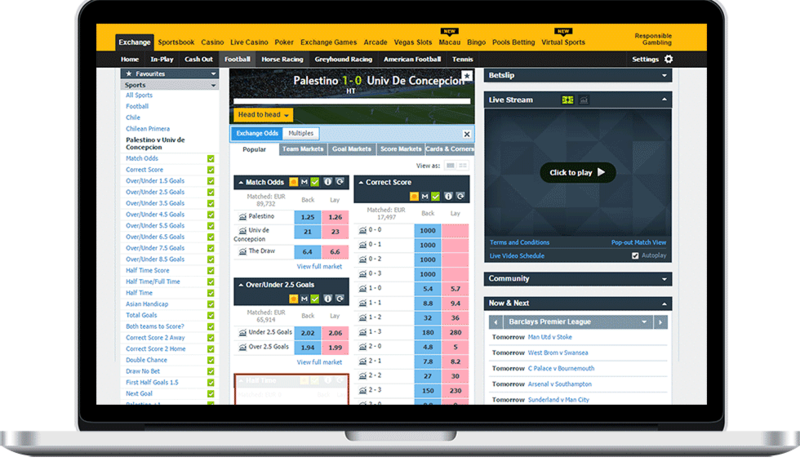 With millions of players around the globe, Betfair comes with huge liquidity and this is the place to earn big money. Every football, tennis, horse racing or cricket game, gets millions of matched bets. Money can be transferred to the betting exchange via bank transaction, all major credit cards, Skrill (recommended) or Paysafe card. It's no secret - people are making a good living with betting exchanges and so can you! It's not an insider secret, it's not a miracle, but it's a very useful tool for everybody who is willing to invest an hour or two daily, getting ready to trade on games. Don't forget to visit our "Sports Betting Strategies" with a lot of useful tips and strategies for your trading adventure!